Revolutionising lamb as we know it, a new breed of sheep is packing some serious meat. 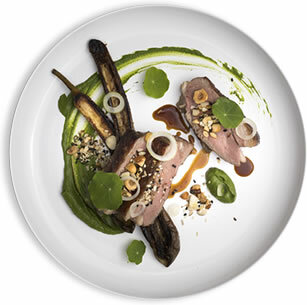 Lamb, arguably one of New Zealand’s most globally recognised exports, has long been admired for its unique taste and melt-in-your-mouth texture. Recently, the sprightly, lovable animal has been noticeably absent from our plates in favour of more sought-after, cultivated cuts such as Wagyu and dry-aged steaks. A group of South Island farmers, however, are changing this for good. While developing sheep to be better adapted to high country environments, these farmers discovered that with a specific combination of genetics, management and feeding, a new breed of lamb could be produced, offering a style of meat never before seen in the animal and elevating it to luxury status. TE MANA LAMB boasts intramuscular fat that melts (much like Wagyu) during the cooking process, increasing the flavour and making the cut less prone to shrinkage. Offering high levels of Omega-3 and polyunsaturated fat, Te Mana is reintroducing healthy, essential fats into the diets of meat-eaters, through the nutritional profiles of the animals. The particular rearing conditions employed also positively affect the lambs’ pH levels, which are crucial to ensuring healthy growth, strong immune systems and general wellbeing. This increased focus on welfare is resulting in animals that produce exclusively top-quality meat for the consumer and is heralding the beginings of a lamb renaissance. In order to maintain consistency and supreme quality, farmers tested over 500 genetic lines during a 10-year period, before settling on the perfect ram; number 211. His offspring alone holds the necessary genetics for Te Mana lamb with 80 new sires tested each year, and only the elite able to enter the breeding programme. With such strict standards, it is not a process that lends itself to mass production, ensuring TE MANA LAMB is available only via a reputable list of some of the world’s finest restaurants. Josh Emett Executive Chef at Oslro Brasserie & Ikn Proclaiming TE MANA LAMB to be one of the most popular dishes on the menu at Ostro, Josh Emett credits the heightened fat content with delivering flavour and tenderness when cooked long and slow. Changing the dish’s accompanying flavours depending on season, the current offering of lamb rump with sweet roasted peppers, confit shallot, marinated olives and a cashew nut puree is hitting the mark with downtown diners. Kyle Street Co-Owner and Head Chef at Culprit Lamb Shouldeh In searching for a unique, elevated product to be served on the bone, Culprit’s Kyle Street finds TE MANA LAMB to fit the bill perfectly. Featured on the menu as lamb shoulder braised in tomato and preserved lemon, highlighting Middle Eastern-inspired flavours with spiced almonds, sumac flat breads, baba ganoush and labneh, Street says its subtle profile lends well to understated accompaniments. The lamb itself is slow braised for two to three hours, allowed to cool overnight and roasted to order, which keeps the skin crispy and the meat wonderfully succulent. Gareth Stewart Executive Chef at Euro Restaurant & Bar tasted a sample of TE MANA LAMB, Gareth Stewart recalled being blown away by its enhanced flavour and finish. In the spirit of working with only the best, he added it to Euro’s elevated menu tout de suite, citing the cut’s intramuscular fat as “exciting” to work with. Stewart underlines that TE MANA LAMB does a lot of the heavy lifting on its own, with much of the flavour sourced from the meat itself. His TE MANA LAMB rump with roasted beets, smoked ajo bianco (a cold Spanish soup), sprinkled in dukkah is proving a sure hit among Euro diners, with many allegedly deeming it the best lamb they have ever tasted. This article originally featured in The Denizen magazine.